I have been building a computer. Not assembling components, but actually designing and wiring it from scratch onto prototyping breadboards. I’ve decided to start writing about the project here on my blog. I have no idea how many posts this will wind up being, or if there even will be others. Let me start by telling you what I’m building. This project has been something I’ve wanted to do for a very long time, but in a slightly different form. I’ve always been fascinated with computers, way back to my early childhood. I remember when I was 5 or 6 years old, going for long walks with my father talking about how computers really worked. 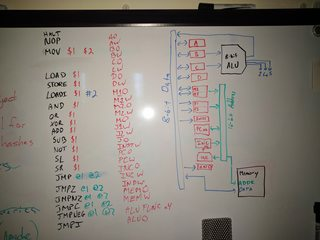 I remember being fascinated that all of the functionality that we see in a computer really just being caused by a large number of switches turning on and off really fast. Think about that for a second. The device that you’re reading this post on is really just a collection of switches. Billions of them (a number that I know I can’t really comprehend). All dancing their choreographed dance. Turning on and off in the precise order to render this next pixel. There’s simultaneously something magical yet poetic about that. I’ve always wanted to ditch the transistor and make a mechanically operated computer. My original idea was to do it with electronic relays. You can find a few videos on YouTube of people who’ve done just that, and there’s an awesome rhythmic sound to hearing the computer actuate. There is a limiting factor there in that it takes a LOT of relays to do anything. Plus if I was going to go that far, I’d want to keep the RAM using the same technology, and so I never wound up doing it. So I tabled the project. For years. Every once in a while I would get a spark and think about it, but it died for one reason or another. Then, in the beginning of January, I stumbled upon a YouTube video by Ben Eater. 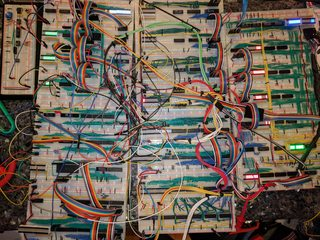 He built an 8-bit computer on breadboards. That was all the inspiration I needed. It wasn’t exactly what I thought of years ago, but it was close enough. Some components I based directly on his (the 8-bit registers are nearly identical for example). Some components are loosely based (the ALU shares some similarity at the core). And others are really far off (the entire address bus and memory system). 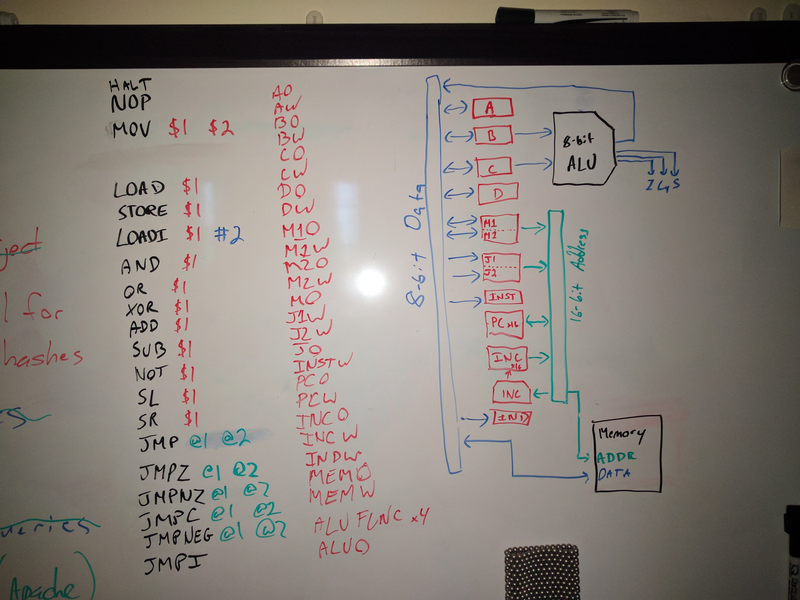 In the process of building and designing the computer, I’ve learned several really important lessons that apply to normal software projects and life itself. I’d like to end this post with a few things that I really learned so far. We talk about the importance of Unit Testing all the time. I’ve been a huge proponent for automated testing and advocate for it for a while. However, it took building a computer by hand to really appreciate the value. Instead, what I started doing was testing each component as I built it. I would build Arduino programs to cycle through all valid (and invalid) input and control states to test a component. Only once it passed would I integrate it into the computer. Now, once I got 1+1=90, I knew it wasn’t a flawed component. I knew the flaw was somewhere in the integration layer. Now I only have about 100 possible sources for the error instead of 100,000, just because I decided to test at the unit level. Most of us are guilty of assuming our design will work just through logical analysis. We put tons of work thinking, drawing and analyzing, and then once we’re done we’re reasonably confident that it’ll work. So we jump forward to actually building it. Well, what happens when we miss something in the design and there’s a flaw? In reality, this happens all the time. Good architects and engineers will notice the flaw and recover; modify as they go to fix it. 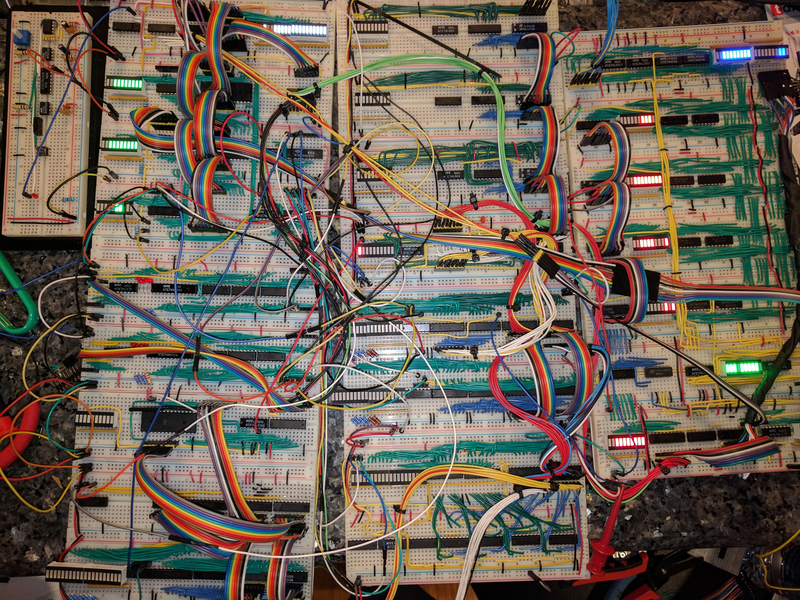 But what happens when that modification requires undoing 100 individual wires and re-routing a component you just spent the past 8 hours wiring… You get frustrated. And look for a better way. So what I started to do was to prototype. Take the design, lay it out, connect the minimum number of wires necessary to prove the design. Don’t wire in permanently, but use jumper wire to “get it working”. This is messy, but takes 5 minutes versus 5 hours to fully wire. Then, once you’ve proven the design, then go into production mode. Looking at a completed project really is daunting. There’s a ton of work and a lot to design. And too much to understand. Yet by breaking down the project into many small ones (build a register, build a bus, build another register, build an ALU function, etc), it became manageable to both design and build. It’s easy when decomposing to miss the forest for the trees. When I started this project I drew an architecture diagram that has helped keep in check and provided guidance towards smaller design components. In later posts I’ll likely go into the design. Talk about why I did something the way I did, the trade-offs I made and how they effected the result. I haven’t quite decided yet. What I do know is that I’m having way too much fun so far, and will keep going on the project. If there’s something specific you’d like to read about, let me know and I’ll try to do a post on it. Thanks for reading!